Arab Peacemonger Is a Warmonger -- Will CNN Admit It? 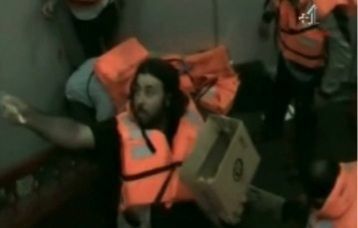 At the beginning of the week, while the Mavi Marmara, a Turkish ferry boat run by the Turkish jihadi foundation IHH [here (pdf) & here & here] was sailing toward Gaza to create a provocation, an incident meant to make Israel look bad in world public opinion, CNN's Rosemary Church interviewed a well spoken humano faker named Osama Kashoo [here] As befits a spokesman for a fake "humanitarian" expedition, Kashoo told CNN viewers that he loved all mankind; he loved peace and all people and all things. See the interview here. 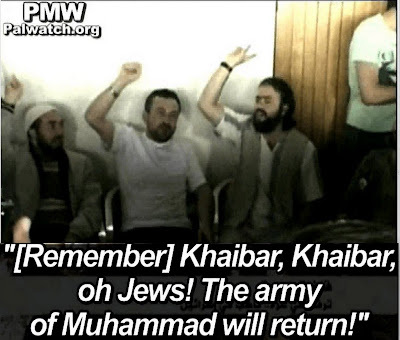 [Remember] Khaybar Khaybar O Jews, Muhammad's army will return for sure. Our peaceful, loving innocuous peacenik, Osama Kashoo, sits among a group of other jihadis chanting away, chanting a war cry, a chant of humiliation of Jews. See here. My suggestion is that you watch the two videos, trying to catch a glimpse of Kashoo on the right side of the group of chanters. Here is a still of Mr Kashoo sitting with his friends and chanting, raising his fist in a quintessentially peaceful gesture. Below is another shot of our two-faced warmonger. See pix of beaten and bleeding Israeli soldiers from the Turkish paper Hurriyet. The Turks no doubt put up these pix to encourage their own goons by showing the Israelis in a humiliating situation. Turkish thuggishness plays into White House policy. Churchill could have prevented the murder of millions of Jews by Hitler. Instead, he waited for the Germans to quietly "finish the job." The European countries and the UN are in no position to talk about “Humanitarian Aid”. Their actions in WW2 show them to be savages, and less than sub-human – especially the British. Eliyahoo, you're right about the UK and Churchill. Remember that British troops waited outside Baghdad during the Farhud of 1941 while Jews were being massacred inside the city. That was on orders of the Foreign Office. The turkish terrorists got what they deserved.They don't care about anyone's lives even their own. They are perfectly willing to get themselves hurt of killed in order to make a statement about themselves.